"In creating, the only hard thing is to begin; a grass-blade's no easier to make than an oak"
What is poetry for? Why do people write it? Although the subject matter is important in a poem, poetry has a special quality that enables atmosphere and mood to be fully expressed…when you ask yourself what a poem is about, you should probe beyond the obvious story and ask further questions about the poet’s feelings and your response to the poem (why do I like the poem?). Asking you to just jump in a write a poem might feel to you like asking you to build a house having never held a hammer. So we're going to ease into it here. Above all, please enjoy yourself! Writing poetry can be hard, but it can also be the most fun you have in a day. "My perfect day is sitting in a room with some blank paper. That's heaven. That's gold and anything else is just a waste of time." **To note, all the writing you do here is not to be handed-in for marking until you submit your collection of polished poems at the end of this unit. We're going to create a collection of words. No rules apply here. We're creating what poet Susan Goldsmith Wooldridge calls a wordpool. So, begin. Just jump right into it, jotting down any old words at all that you think of, that have value to you one way or another, either in meaning or sound or the way they look. Another way to do this, which leads to different results, is to begin from a word, or a prompt. Put the word/prompt you choose in the middle of the page, and circle it. Then, without too much thinking, write words that you associate with the central word. 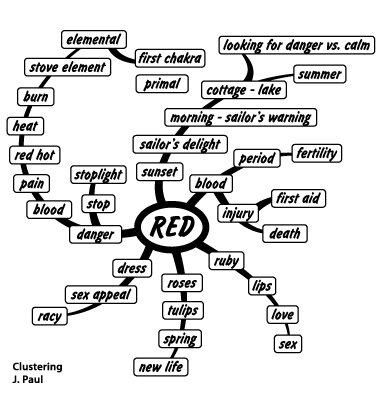 This is known as mind-mapping, and it can generate lots of images and ideas that you didn't know you had in you. Try that now, if it appeals to you. Often beginning with a colour can work well. And you don't have to limit yourself to one word "answers" to the central word. You can jot down a few words, or a phrase, maybe a memory or a name of someone you know that you associate with the seed word. to hear, nasturtiums buzz blue grass catnip catalpa catalog." Next, place your words in a visual format, a word cloud, and add them to your website (if you are unable to embed your word picture, use your "Snipping Tool" on your computer to copy the image and paste it into your website.
" the rhythm, the music in the words, the circle of voices around the room, the associations, the well of minds casting out words like water in a fountain, words next to words in new ways and the lack of them spreading down and across the page takes us to the state of mind poems come from." It will also help us to use words in different ways, to "treat words as if they were paint, clay or wood; allow words to be a physical material to shape, mold, chisel and blend"
looking at, what I see and what it means. What I want and what I fear. Throughout this unit, we will be doing many exercises together, but beginning with one that is just about getting words out and onto the page. Natalie Goldberg popularized this technique called freewriting, which has been around for many years. Others call it stream-of-consciousness writing, because it tends to rush out of your brain like water. Why do we do these exercises before writing poetry? Aside from simply getting you to write, they allow you to get yourself out of the way a little more than when you sit down and tell yourself to write a poem. Take a pen or marker of a different colour and circle things that jump out at you as having more interest, images or memories that make you a little more excited about them. Then, take one of these words or phrases and put it at the top of the page, and begin to write whatever comes into your mind. Without stopping. Without editing, or worrying about what it might sound like. You are free, as Goldberg says in her rules of writing practice, to write the worst junk in the world. Write for ten minutes. A vital part of this list, when entering the world of writing first drafts, in any genre, is this: to leave the inner critic or editor out of the process. That "person" inside of you can come out and be useful at another time; indeed, it's a necessary person to have around. But now, for your first drafts, just write. Just leave that nag, perfectionist, teacher, older sibling, voice of dissent, behind. Get your thoughts and feelings out on the page first. If that's not enough, why not give this site a try: Dr. Wicked's Write or Die site. When you stop typing, the site makes it worth your while to keep going, in the form of gentle "torture" — nasty colours, awful sounds, etc. You will want to keep those fingers moving! Here's another freewriting exercise to generate a first draft, but with a more poetic bent. Then, take a word or phrase from "Wild Geese" and copy it at the top of your page. After that, just begin to write things down; your first thoughts, uncensored. Go for at least ten minutes.